Universities are inspiring places. With cutting edge research, passionate scholars, and academic contributions across a cornucopia of disciplines, universities are driving innovation and tackling real challenges in our world. 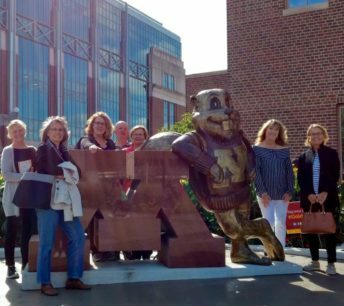 This vibrant university community serves as the backdrop for the University of Minnesota Advanced Careers (UMAC) initiative, a “gap year” for experienced adults as they transition from career jobs into what’s next. UMAC fellows come back to campus for an academic year to explore ways to use their skills for the greater good. Through a combination of classroom learning and hands on application, fellows expand their perspectives while charting a course for the future. Universities are ideal settings for people to navigate transitions in encore adulthood — that time of life when people are ready to leave careers but not the workforce. Like young adults, encore adults want to build career skills and sharpen strategies to navigate the new world of work. And like their younger counterparts, they also want to use their skills to make a difference. For those of all ages, universities are places to learn and grow and apply that learning in meaningful ways in our communities. UMAC combines interdisciplinary learning, personal renewal, and community engagement. UMAC fellows participate in lectures and seminars, sparking ideas and new ways of thinking. They form a learning community, crafting their own transitions while exploring ways to make a difference in this next life stage. They participate in classes like those in the Grand Challenge Curriculum, expanding their understanding of society’s challenges while targeting practical solutions. They connect with the many centers and institutes at the university, finding ways to get involved and impact issues that matter to them. During spring semester, fellows spend 10-20 hours a week working on a project for a social impact organization, applying their workplace skills and expertise. Fellows help host organizations build capacity, gain traction on an important project, and, ultimately, have a broader community impact. UMAC’s intergenerational design is a highlight for fellows and undergraduate students alike. Fellows and students find that age diversity in the classroom enriches discussions and fosters understanding. Last February, this aspect of UMAC was featured in an article in Next Avenue and Forbes. UMAC represents an emerging innovation in higher education. Universities experimenting with encore initiatives include Hamline University, Notre Dame, Stanford, Harvard, and University of Texas. Seminaries are designing initiatives as well (e.g. Kaleo Center at United Theological Seminary, Union Theological). 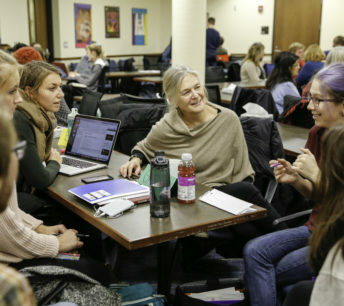 As Professor Phyllis Moen describes in her pivotal book, Encore Adulthood: Boomers on the Edge of Risk, Renewal, and Purpose, we need new language and roadmaps that reflect how encore adults are working and living their lives. UMAC offers an innovative pathway to a post-career life that combines purpose and meaningful work with social impact.